Crusts play such an important role when making pies and tarts. While we often think of them as only a shell to hold a filling, we also need to think about how their taste and texture will pair with that filling. One of my favorite crust recipes is this Shortbread Crust, that has a buttery sweet flavor and a crisp texture. It is like a shortbread cookie only in tart form. It goes well with cream fillings, fruit fillings, chocolate fillings, and even nut fillings. It is quick and easy to make, only needs 15 minutes of chilling time in the freezer, and takes under 15 minutes to bake. Definitely a good recipe to have in our repertoire. 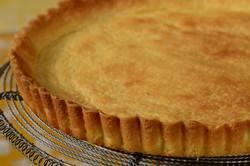 This Shortbread Crust recipe makes enough pastry for an 8 or 9 inch (20 to 23 cm) tart. I like to butter or lightly spray the tart pan with one of those vegetable cooking spray as this makes it much easier to remove the sides and bottom of the pan after baking. Now, this Shortbread Crust is easily made in your food processor. Make sure to have the butter cold from the refrigerator and cut it into small pieces so it blends easily into the flour. Also, since the flavor of this crust comes primarily from the butter, try to use one of good quality. To make the pastry first process the dry ingredients together, and then add the butter. Pulse the ingredients just until the pastry starts to clump together, but is not a solid ball. Then transfer the pastry to your prepared tart pan and spread it evenly over the bottom and up the sides of the pan. This can be done with your fingers or the back of a spoon. The bottom of the pastry is then pricked to prevent puffing up during baking. More often than not, this Shortbread Crust is pre baked. Common practice is to line and fill the unbaked pastry crust with pie weights or rice before baking to prevent the pastry from shrinking and puffing up. But you can eliminate this step by putting the unbaked pastry crust in the freezer for 15 minutes. This sets the crust which prevents these problems. The pastry is baked at a high temperature until golden brown, about 13-15 minutes. Once the pastry shell has been baked, you may want to 'seal' the crust. This 'sealing' prevents the tart filling from softening the crust over time. You can spread a thin layer of warmed apricot glaze, or even melted chocolate, over the pastry once it has completely cooled. The unfilled baked pastry crust can be covered and stored for a few days before filling. Shortbread Crust: Lightly butter, or spray with a non stick vegetable spray, an 8 or 9 inch (20-23 cm) tart pan with a removable bottom. Preheat oven to 425 degrees F (220 degrees C) and place rack in the center of the oven. Place the tart pan on a larger baking sheet and bake the crust until golden brown, about 13 - 15 minutes. Remove from oven and place on a wire rack to cool. It is now ready to be filled. If desired, seal the cooled crust with an apricot glaze or melted chocolate. The shortbread crust can be covered and stored for a few days. Apricot Glaze: Heat 1/4 cup (60 ml) apricot jam or preserves in the microwave, or in a small saucepan over medium heat, until liquid (melted). Strain the jam through a fine strainer to remove any fruit lumps. Brush the warm glaze onto the bottom and sides of the cooled pastry crust. Chocolate Glaze: Melt 1 ounce (30 grams) of semi-sweet chocolate in the microwave. Brush the melted chocolate over the bottom and sides of the cooled pastry crust.